at the Elk Grove South County Democratic club meeting. 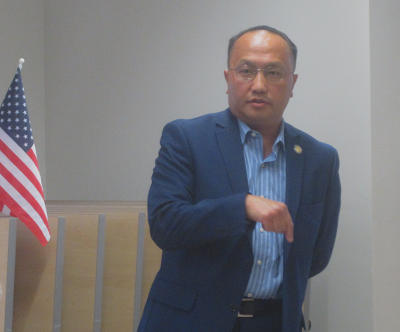 As the guest speaker at the Elk Grove-South County Democratic Club's monthly meeting, Elk Grove Mayor Steve Ly covered an assortment of topics at the session held on Tuesday, July 11 at the Elk Grove Public Library. In his opening comments Ly complained that even though the city has a population of 171,000, the city council members and Mayor positions remain part-time. In spite of this, Ly said the city is able to function because of cooperation of the council members and the work of the city's staff. "They [city staff] have made their fair share of mistakes just like us," he added. Reading from a prepared script, Ly also discussed recent developments including passing the budget for fiscal year 2018, the new animal shelter, and the city's efforts to recruit new retailers. That effort, which is spearheaded by the city's economic development director Darrel Doan, has retained the services of Birmingham, Ala.-based Retail Strategies to bring high-end retailers to Elk Grove. Another topic Ly discussed was the unfinished Outlet Collection at Elk Grove. The unfinished shopping center owned by the Howard Hughes Corporation (HHC) has sat idle for nine years this month. Noting the new sign installed at the facility saying it would be open in 2018, Ly expressed optimism that the stated goal would be met. Ly also acknowledged that since becoming Mayor last December he has been unsuccessful in arranging a meeting with HHC. "I have not had a chance to meet with them," Ly said. "I've not had any success with them." Commenting on the proposed Wilton Rancheria, Ly noted the litigation against the city and said the Tribe is now negotiating with the State and Legislature on the gaming compact. He said it was "unclear" when construction would start. During a question and answer session that was conducted by written questions, Ly attempted to respond to an assortment of topics ranging from the location of NRC Manufacturing to Elk Grove to by-district voting. When answering a question about the relocation of NRC Manufacturing to Elk Grove, Ly said that when former Mayor Gary Davis made the announcement at the 2016 State of the City address, the relocation of the company was not guaranteed. "They were just in the talks, nothing was guaranteed," Ly explained. Ly added one of the sticking points is NRC had sought incentives to locate here, and he said it was considered unfeasible. Ly also briefly addressed a question on the proposed $100 million soccer stadium and field on the 99-acre Grant Line Road parcel saying that city staff is putting together plans, but there have been no additional developments. Regarding a question on establishing Elk Grove as a sanctuary city, Ly said he supports the idea, but acknowledged his fellow council members were not supportive. He noted that "I'm respectful of my council members" and added that two Republican and one Democratic council members were resistant and would not be supportive of passing a resolution. Ly also addressed an issue that fellow Democratic Party members have repeatedly criticized him on - the endorsement of Republican incumbents for City Council over qualified fellow Democratic candidates. "In non-partisan races, I have endorsed Republicans," Ly admitted. "The truth is that I didn't know that this person was a Republican." Ly said in this unspecified candidate he shared the same family and educational values, but committed to only support and endorse Democratic candidates in the future. With regards to by-district election of council members, Ly said he now supports the change from the current from district system. When asked about the city's climate action plan, Ly said he would support bringing it back to the city council for consideration of more stringent standards. "I think the bare minimum is just the bare minimum," he said. "We have only one earth." Ly further explained given the trouble he has with bringing things to the council, controversial things like enhancements to the city's climate action plans are all that more difficult given the resistance from his colleagues. In response to his assertion, club member Connie Conley advised Ly he needs to get the opposition from his colleagues on the record. "The key is you have to get the dissension on the record," Conley said. "We can't do anything about replacing those folks if we don't have firm a 'no' they are against climate change. Then we have something to go after." In expanding on the question Ly was asked about the 100 acres of land outside the city limits – aka the SOI ruse – the Elk Grove City Council spent 4.6 million dollars of taxpayers’ money on borrowing from the drainage fund, Ly responded, “Nothing is happening.” I guess he was asleep during a recent closed session item whereby it appears the council now appears to be selling the land with EGYSL being the current bidder. However, there hasn’t been any more closed session items of late on the sale. Has the deal hit a snag after EGYSL was sent critical environment and safety documents one can bet the city of Elk Grove didn’t turn over in good faith? Ly didn’t seem to remember that. That and other crucial facts on other very noteworthy questions. What that tells me if he isn’t going to answer questions truthfully or knowledgeably in the first place is that he didn’t remember or he wasn’t fully educated on the agenda item in the first place. Therefore, voting on items which touch our daily lives of which he didn’t have full knowledge or understanding. And that is the real scary part here! Since first being elected to the EGUSD in 2012, then the Elk Grove City Council in 2014, and capped off by his election as Mayor last year, the one word that best describes Mr. Ly is underwhelming. As he seems to be learning, being Mayor is fraught with pitfalls. As suggested in the story, he does have a chance to redeem himself politically. Having watched Mr. Ly's performance at city council meetings, he lacks the force of conviction when trying to bring something forward with his city council colleagues. Perhaps if he gave a full-throated argument of the issues he is advocating, he would have some success. Or as Ms. Conley suggests in the story, make his colleagues go on the record. Can Mr. Ly redeem his political fortunes? That fate lies in his hands. If Ly had a backbone, all he would have to do is say he would like to agendize whatever item it is. Ask for discussion. Then call on each of the council members one by one asking them to respond “Yes” or “No.” Simple as that but it appears that he is fearful to do so and Hume, Detrick and Suen know it; so they have the upper hand - given to them by Ly himself. When is Ly going to get it that he can have barrels full of honey and he won’t catch these flies? Hume, Detrick and Suen will only respond to extra strength vinegar and someone with the strong character to stand up to them! Ly hasn't got the political prowess to do anything but take what he gets from Hume, Detrick and Suen. Meanwhile, he is happy to run around the city mugging for silly photos with eternal hopes that his political fortune will change. If he isn't more cautious with his observations of the council, he's likely to get a wedgie at the dais.